All numbers used in the calculations can be modified through the input fields! The basis of this page is my redistribution calculator, which is to show the redistribution inherent in our current monetary system. This page instead is showing the redistribution as it should look like if Germany was to introduce Freigeld, a money with a circulation safeguard. Of course Germany is just an example: any country in the world would do. The principle is universial - only the preset values for assets (irrelevant with Freigeld), incomes, and for the population would differ. The preset values for the “lower” income groups in this page are realistic data, while I had to raise the “non-interest” income of the upper income groups, so that the group order remains ascending. This kind of redistribution should also take place at the Freimarkt. Most striking in the comparison between this (Freigeld) redistribution and the interest redistribution is how much straighter and more transparent this system is. 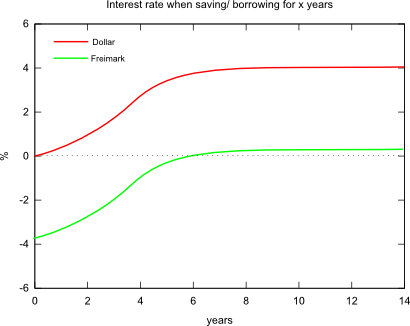 The accumulated assets no longer play their crucial role, because Freigeld causes the interest rate to approximate zero (see interest rate graph below). Generally, there is much less redistribution. Especially the “middle classes”, who in Capitalism carry the heaviest burden, are completely freed. The total number of households that pay and households that benefit is balanced in this system (wheres in Germany‘s current “welfare capitalism” only the richest and poorest ten to twenty percent benefit). The circulation safeguard is a “liquidity fee“. When due (here the annual rate is used, but discounting 1/12 of that monthly would yield the same result) all cash is reduced by this rate (e.g. via stamps on banknotes or money exchange you have to pay for; electronic money could be handled more conveniently). The liquid asset rate denotes the amount of their annual income the households are supposed to keep liquid (in cash or on their checking bank account). A value around 50% seems justified, at least for the highter income groups (which matter more in this regard) because short and mid-term invests would still yield “interest” below zero. The savings are calculated as “incomes” - “expenses”.